“Everything is more complicated than it’s painted.” A truth of being a farmer, and a larger truth about life. Those words belong to Nick Lapham, a conservationist turned farmer, who has learned their meaning in the deepest possible way. “We bought Sunnyside for a number of reasons,” Nick explains. “I have a background in environmental policy, particularly wildlife conservation. The farm borders Shenandoah National Park and has lots of biodiversity: bears, bobcats, rattlesnakes, salamanders, an abundance of birds. To be so close to DC and have that degree of wildness is pretty amazing. “I was also interested because of my professional background. I’d spent a good deal of my life advocating the marriage of economic development and environmental protection. The farm gave me an opportunity to actually do it: try to run a viable business consistent with conservation principles. “It was a proj ect of my whole family. My father was on the board of American Farmland Trust where he was active in the effort to establish some of the first local farmers’ markets in the region – an effort that eventually split off as Freshfarm Markets. My mother ran an organization concerned with community sustainability, and my wife, Gardiner, works in public health. Then came one of those complicated and unexpected twists on life’s journey. “My father died suddenly six weeks after we bought the farm,” Nick relates. Tony Lapham’s death was a great personal loss to many people, including me. He was one of my earliest and most loyal donors and friends while at the National Fish and Wildlife Foundation, and he is how I got to know Nick. “The first job I ever had was working for you, Amos, as an intern at NFWF when it was still in the Interior Department,” Nick reminds me. Nick later worked on the Yellowstone wolf reintroduction project and then returned to Washington where he served as an environmental advisor in the State Department and White House during the Clinton Administration before holding senior positions at the UN Foundation, Conservation International and World Wildlife Fund. 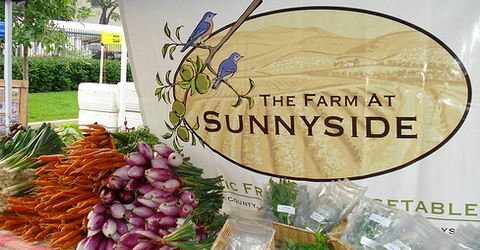 “Our goal at Sunnyside is to grow food and grow biodiversity in a mutually reinforcing and sustainable way that improves the land, provides for the people who work there and demonstrates synergy between agriculture and conservation. One of our first decisions was to put the farm under easement. We worked with the Virginia Outdoors Foundation and concluded the easement in 2009. Please check back tomorrow to learn how Nick Lapham is learning to take the long view on more of life’s complications by practicing the art of native grass restoration.